It’s hard to believe it’s been 10 solid years since The Heavy Pets hit the music scene back in 2005. It didn’t take long for people to catch wind of the raw talent and fresh new sounds that these boys were bringing to the table. Fans easily began to fall in love with their eclectic jazz, funk, reggae type sound. Within a short amount of time, this now well-established American jam band gained national recognition and a very loyal following. Looking back, we can blissfully reflect upon all that has happened in their musical journey over this last decade and embrace the impact they have made on music lovers near and far. In the early days, original members Jeff Lloyd, Mike Garulli and Joe Dupell lived in upstate New York and performed in the Syracuse/Albany area as My Friend’s Band. Shortly after graduating college, the members relocated to South Florida along with Jeff’s cousin Ryan Neuburger. Jim Wuest, also a My Friend’s Band alum, made the move and joined the band about a year later, and it was then that The Heavy Pets 5-piece format was complete. In no time, the band had played upwards of 300 shows and shared the stage with several well-known artists such as Bernie Worrell of Parliament Funkadelic and Tea Leaf Green. In 2008, Julius Pastorius (son of Jaco) began drumming in place of Ryan Neuberger. Before long, the talented Jamie Newitt, a childhood friend of Wuest who actually subbed for MFB during a visit to Syracuse, took over just as The Heavy Pets were preparing to perform at Langerado Music Festival at Big Cypress in Florida. From that point forward, the band gained further momentum and continued to progress musically. The response from their first two albums, Whale and Slow Motion Conductor, was extremely positive and received play on SiriusXM’s JamOn and college radio nationwide. Towards the end of 2008, Dupell left the band and a string of bassists filled the void including Mark White of the Spin Doctors, Felix Pastorious (twin brother of Julius) and Justin Carney (another close friend from the Philadelphia area). Popularity was taken to the next level with the release of their self-titled album in 2010 and the mostly acoustic album Swim Out Past the Sun in 2011. Songs like “Girl You Make Me Stupid,” “Jackie Bones” and “3AM” caught a lot of attention and made it hard not to hop on The Heavy Pets train. The band continued to gain further exposure by opening for big name artists such as Umphrey’s McGee and performing late night after-parties for critically acclaimed acts such as Phish. Their unwavering dedication to touring and their dedicated fans have truly put them a step above many other musicians. After witnessing the boys performances in various parts of the country, it was clear to see the overall passion and commitment that they possessed as a whole. When Tony D’Amato joined the band as the new bassist in 2012, it seemed that The Heavy Pets performance got even better. Having come up with Newitt as high school jazz bandmates that continued playing throughout college in Delaware in Spontaneous Underground, he truly brought that brotherly love into the picture. With the release of songs like “Keep Me Running” and “Movie Star” they gained an even bigger following. As the jams continued to permeate the ears of eager fans across the country, the hours of practice and hard work became even more evident. Not to mention, the chances of someone getting frisky in public during the first few notes of “Sinner” seemed to increase. Now here we are, in 2015, looking back with gratitude at a decade of amazing THP music. 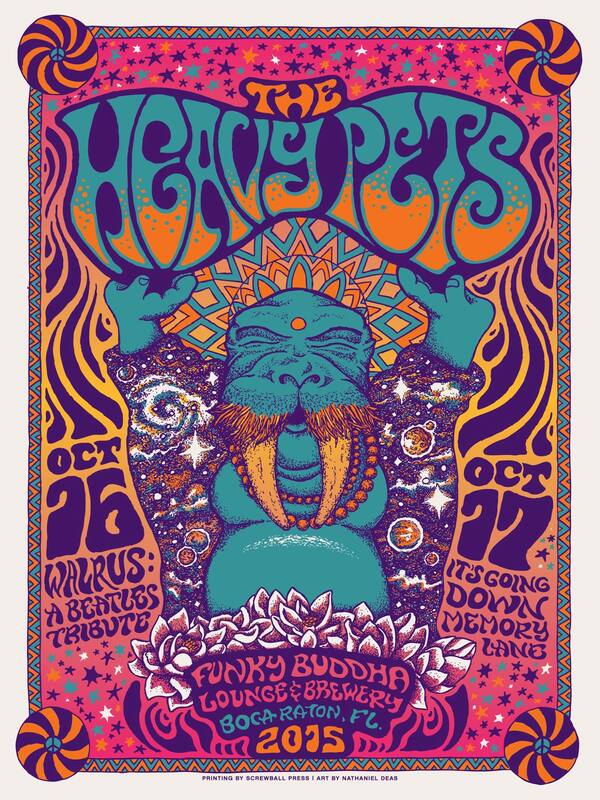 The Florida music scene is proud to call The Heavy Pets our local band, and we excitedly look forward to celebrating all ten of their upcoming anniversary shows. For those of you who plan on attending the festivities this weekend, be sure to wear your groovin’ shoes as the Pets host a two night party at the Funky Buddha Lounge & Brewery in Boca Raton. The band will be gearing up for their debut performance of “Walrus: A Beatles Tribute” on Friday 10/16 and “It’s Going Down…Memory Lane” on Saturday 10/17. Also, let’s not forget to mark our calendars for 11/1, as the boys will be putting on another epic performance at the magical Spirit of the Suwannee Music Park for the 3rd Annual Hulaween Music Festival. On that note, cheers to The Heavy Pets and the 1,000+ shows that they have played and here’s to hoping they continue the journey for thousands more!